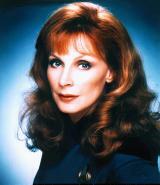 STARFLEET PERSONNEL FILE -- Beverly C. Crusher, M.D. Doctor Crusher has consistently shown to be not only thorough but conscientious in her daily work and routine. She is a superior scientist in various fields of research medicine such as xenoimmunology, curing or treating the so-called Tsiolkovsky virus, the airborne virus known as Ligonese poison, and Barclay Syndrome, which she discovered and named after its first patient. Her contributions in practical forensic medicine have had galactic import, leading to improved trust with the Klingon Empire after her investigation of former Chancellor K'mpec's murder, and with the Ferengi Alliance regarding the murder of Doctor Reyga by the Takaran rival Jo'Bril. Unfortunately for this office, her unorthodox methods bordering on cultural insult proved quite troublesome at times in the latter case even though she was later exonerated. Even so, Starfleet Medical applauds Doctor Crusher for her stand against a lack of concern for experiment research on patients while other treatments are still viable, citing her logs concerning Lieutenant Worf's spinal paralysis and Doctor Toby Russell's genotronic research. And her use of ship's phasers, of all things, to deliver a live-born spacefaring alien as large scale Caesarean section procedure is nothing short of ingenious. In view of reports testifying to Doctor Crusher's actions to care for 21st century natives aboard her vessel during temporal maneuvers with possible Prime Directive implications, this office finds no fault with her performance in light of the greater temporal crisis at hand. Although suffering her share of life tragedies, Beverly Crusher brings to her work and her relationships a deep-rooted sense of ethics as well as a freshness and good humor that is infectious. Indeed, at times she has served as the glue to hold situations together, while at other times acting as the needler to provoke a necessary reaction or course. Doctor Crusher spent her formative years with her grandmother, Felisa Howard, who raised her from an early age after her mother died. In fact, it was Felisa's knowledge of folk medicine which allowed the two Howards to be among the few survivors of the Arvada III colony disaster - inspiring the younger Crusher to choose medicine as her life's work. Unknown to her at the time, Felisa was involved with an anaphasic "lover" who derived life-affirming sustenance in return for the companionship - a secret stretching back through generations of the family which nearly consumed Doctor Crusher herself. The discovery occurred only upon Felisa's death in 2370 on Caldos IV, where they had lived after Arvada III until Crusher left her to attend Starfleet Academy. Before those moves with Felisa, young Beverly had spent her earliest years on Earth's North America, which she still considers "home"; she studied tap and jazz dance there and won several awards in competition in St. Louis. Intimate relationships have been mostly healthy for Crusher, who suffered with typical human growing-up angst: getting a crush on a soccer player three years her senior, Stefan, at age 8, and dying her naturally red hair brunette at age 13 when she fretted over teenage popularity. It was her marriage to Lt. Cmdr. Jack Crusher that provided the major trauma of her adult life when he died on an away team mission off the U.S.S. Stargazer under Captain Jean-Luc Picard in 2355. Before their wedding on July 20, 2348, during her medical schooling, the future Crushers had dated for several months until he finally proposed by sending her the book "How To Advance Your Career Through Marriage." The two had first been introduced by Walker Keel, who with Jack had been Picard's closest friend during their early years in Starfleet; ironically, her relationship with Jack followed an intense but brief affair that had already run its course. The new couple and Picard became close friends during those years the men served on Picard's U.S.S. Stargazer. The captain later accompanied her to the Starbase 32 morgue to view Jack's corpse, but it was not until years later again - again, in 2370 - that Picard confirmed her suspicion that he too was attracted to her, thanks to a telepathic linkage while held as spies on Kesprytt. Picard had denied there would be any personal problems when she signed aboard the U.S.S. Enterprise as his CMO in 2364 at Farpoint Station, but in reality both knew they shared a latent interest in each other by the time of the Tsiolkovsky virus epidemic that brought it out only a few weeks later. Her husband's death also left a void for their son, Wesley, who had been born a year after they married. A lieutenant at the time, Jack Crusher recorded the first and only entry in a series of holo-tape messages to his infant son, but she opted not to share it with Wesley until 2367. As a mother, Doctor Crusher raised a gifted, intense young man alone, never resorting to corporal punishment until suffering the effects of Sarek's bendaii syndrome. Astounded at the Traveler being's prognosis for his development in 2364, she fretted later that he was working too hard at the expense of a social life. His role in the Nova Squadron scandal at Starfleet Academy in 2368 shocked and saddened her without affecting their basic relationship until his departure with the Traveler two years later. In her later years Dr. Crusher had another intimate yet short-lived relationship with the Joined Trill ambassador Odan, and had displayed affection for an evolving Zalkon called "John Doe" and visiting historian Berlinghoff Rasmussen - the latter only until his time-traveling story turned out to be a hoax. Doctor Crusher, who often serves a night watch on the bridge, aided in the capture of the renegade Borg under Lore in 2370 with the strategic loss of their craft while in command of the Enterprise. She has not shirked from risk on away missions, as when exploring the Borg ship upon Picard's abduction in 2366. She was taken as a hostage by the Ansata terrorists to provide their medical care on Rutia IV earlier that same year, and was nearly captured by Cardassians with Worf on a covert raid on Celtris III with Picard, who was taken. Ironically, she almost died in a diminishing universe created from her own mind, thanks to a subspace warp bubble experiment of her son gone awry. As can be seen from the theatre masks decorating the walls of her quarters, much of the doctor's well-rounded personality stems from her many interests in the stage arts. Although she hid her dance skills in later years to avoid the hated nickname of "The Dancing Doctor" that stuck in medical school, she has actively fostered her own acting class and theatre troupe here aboard the Enterprise. Among the productions she has directed are "Cyrano de Bergerac," "The Pirates of Penzance," "Frame of Mind," and "Something for Breakfast"; her students have included Lieutenant Barclay, a reluctant Commander LaForge, and even Commander Riker, whose halting first scenes improved dramatically under her coaching before culminating with his riveting performance in "Frame of Mind." Beyond the arts, another hobby is ethnobotany, and she can more than hold her own in poker. She is fond of fine-weave metallic fabrics. She reports a mild fear of heights, although this counselor has not seen it detract from either her duties or recreation. Having survived the second Borg invasion and its temporal repercussions, I am pleased to review logs revealing Doctor Crusher's clear-headed, quick-thinking actions to evacuate her patients and as Picard's temporary XO during the ship evacuation process. I also admire how she overcame her long-time disinclination toward Emergency Medical Holograms to use it as a tactical tool during the crisis.